Dinan to BMW M: "We'll take it from here." If there’s a single complaint we’d slap onto the BMW M2, it’s that the coupe is slightly less powerful than the M4. Of course, the power discrepancy is all politics—BMW can’t just allow the lesser car to cannibalize sales of the older M4 with optimal dynamics and lower price point—but it’s managed to make the M2 enticing enough to render it an enthusiast favorite. Real gearheads, though, don’t settle for anything less than exactly what they want. These are the kinds of enthusiasts that Dinan caters to. With 38 years of experience tuning Bimmers, seeing a Dinan badge on a BMW is a clear indication that it’s a car from another realm. Unlike other tuners, Dinan one knows what it’s doing. Everything about this BMW M2 S2 package is for built performance, but the exterior doesn’t exactly advertise it that way. And why should it? The less showy sheet metal, the better. More pink slips from unsuspecting challengers at the drag strip that way. 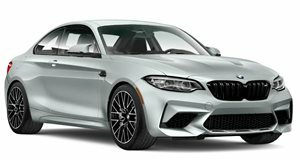 But the ECU tune, upgraded turbocharger, aftermarket exhaust and an intake to feed it are not enough to complete the tune, even if they work to add 81 horsepower to the 365 horses the standard M2 has. Power, after all, is nothing but chaos without an element of control, and to harness all 446 ponies, Dinan added an adjustable coil-over suspension and bigger brakes since BMWs apparently are the best cars at crashing. The results on paper tell part of the story, but listening to the car speak for itself is the way we’d rather learn.